城市安全系统在车辆每次启动时会默认开启，但驾驶员可将其关闭。如果将其关闭，系统会在车辆下一次启动时再次默认为开启。 City Safety functions only between 3.6km/h and 30km/h, so will not assist in accidents at ‘highway’ speeds. 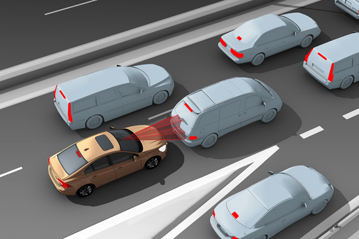 Its lidar can detect vehicles which are at a standstill or which are travelling in the same direction and works at night as well as during the day. However, the sensor is compromised if it is covered by dirt or snow, or in adverse weather conditions such as thick fog or heavy rain. To mitigate this, the sensor is sited in the area which is swept by the windscreen wipers.